In 2012, New Zealand Oil Services Limited contracted Page Macrae Engineering for the Z Energy Mount Maunganui Terminal upgrade of its slops system. As the head contractor for this project, we oversaw the mechanical, electrical and civil works for the project. The project required the construction and installation of a new 120,000L slops tank and associated pipework to replace the existing redundant tankage on site. The slops system was upgraded to improve functionality and move towards a closed system for slops handling at the terminal. As the terminal was live, planning was critical to ensure there were no disruptions to site operations. An earlier project in 2007 included demolition of a decommissioned 5,000m³ storage tank and the construction of a replacement tank including civil works, product and fire system piping and electrical works. Work was carried out within the hazardous area on site and completed on time. 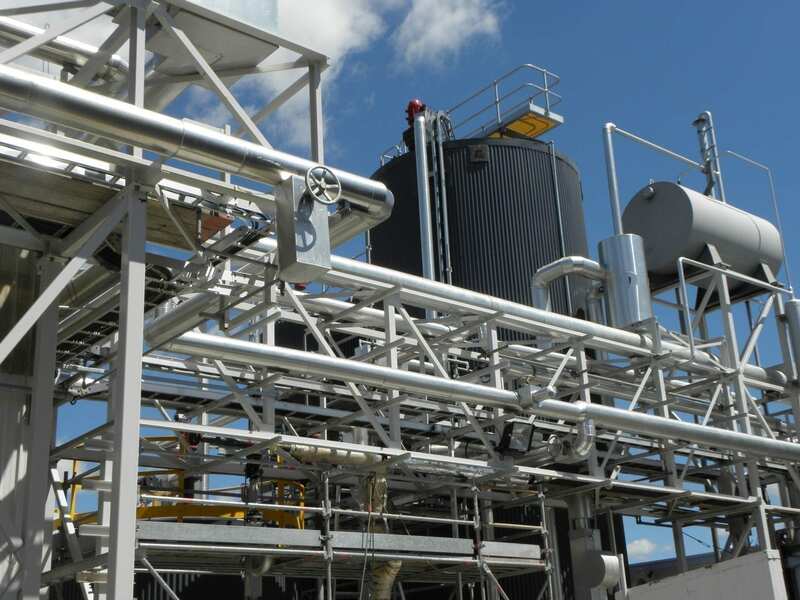 In 2010 Page Macrae Engineering was contracted by Terminals New Zealand Limited to upgrade the Downer Mount Maunganui Bitumen Plant. The project included the demolition of the existing facility and construction and installation of six new API 650 storage tanks, mechanical equipment and piping. A new emulsion plant was installed and major refurbishment of the existing tanks on site was undertaken to meet code compliance. Pipe spooling for thermal heating and product was completed in our Mount Maunganui workshops then transported to site for installation. Timing was critical to the success of the project. Downer needed to take delivery of raw materials from offshore in time to meet production requirements for 2011 roading season. The project was completed in seven months – on time and to budget. In 2013, an additional 50m³ tank was constructed and installed. In 2009 Page Macrae Engineering was contracted by Bulk Storage Terminals Mount Maunganui to construct two 1,200m³ aviation fuel storage tanks and a 1,500m³ caustic storage tank. Tanks 37 and 38 (each 1,200 m³) were constructed in sections in the Page Macrae Engineering workshops before being assembled on site. Tank construction progressed during civil works, shortening the overall construction time, delivering both tanks within a tight timeframe. Tank 9 (1,500m³) and Tank 11 (10,500m³) were built onsite in a limited access area using Page Macrae Engineering’s unique jacking system. The system has proved to be safe and efficient for the onsite construction and installation. In 2015, Page Macrae Engineering returned to construct a 10,500m³ fuel storage tank.